Children and staff from five of the Co-operative Childcare nurseries had the exciting opportunity to work alongside author & illustrator, Pippa Pixley, to create a boxed set of Little Pioneers storybooks. The children discovered the secret of how Pippa gets her story ideas, creates characters and builds stories around them. She also demonstrated how to make scrumple puppets from paper and fabric, turning them into an interactive story performance. The children had lots of opportunity for joining in with movement and songs. Inspired, they made their own characters and had a fantastic time as they explored and shared their ideas through drawing, emergent writing, storyboarding, story mapping and roleplaying. Pippa gathered these ideas and incorporated them into the narrative: Ping was painting a purple butterfly with her friend Ela when a gust of wind blew it out of the window. Here is a glimpse of how the collaborative story-building process develops from things the children say and do (and what is important to them) to storyboard sketches and finally to a finished spread . . . Invite Pippa to bring an Author Day or project to your setting by using the Contact Form. How can children’s learning be extended by exploring 3D modelling? How can we develop their capacity for higher order thinking? How can this lead into storying? This was a six week project to explore storying through 3D modelling, in which children, their parents, and their teachers could discover together exciting opportunities for crafting stories. The children were focused and involved in planning, designing, making, exploring and problem-solving. They worked individually, as well as with each other and their parents, to share creative ideas on how to make machines and contraptions. The children together with their parents created stories, acted out stories and made books – with ribbons, staples, twigs, tape, and string. At the end of the sessions the children enjoyed a circle time in which they shared their original stories and models with the rest of the group. To book a Sculpting Stories Project for your setting get in touch with Pippa by using the Contact Form. The aims of the project were to encourage storytelling and retelling, and to help the children develop their skills to tell a story with a beginning, a middle, and an end. Each of the six sessions started with a story: a well-chosen book with plenty of opportunity for discussion; or an interactive story told with movement, rhyme and song. Every week Pippa introduced a different approach to storying centred on a new material or fascination – clay, light, inks, shells, found objects, bubble-wrap. After introducing the children to the sounds of the sea in a giant conch shell Pippa shared her story of The Little Hermit Crab that needed a new shell. Then the children explored and examined all different shapes and sizes of shells. This added to their knowledge and understanding, and in turn helped them form their own stories, crafting their concepts from clay. Pippa used rhyme and song to help the children to learn vocabulary . This was so that they could internalize and use it in their own stories. Combining actions and sounds helped them to consolidate this. The children then had the opportunity to retell or remake their stories in a variety of ways: through clay, through paint, through mark-making and through emergent writing. At the end of each session the children would share back what they had made and retell their stories. This was an important part of the process because having an audience for your story, and receiving praise for what you have achieved, gives a sense of purpose and accomplishment. Pippa started the session with the performance of a magical story- The Littlest Owl -a story of friendship, adventure and the excitement of the dark. All the characters were made from nothing but bubble-wrap and sticky tape. Bubble-wrap is a wonderful medium for children to use as it is very tactile – fabulous for little hands to press and pop. In addition to being great fun it also encourages the development of the pincer grip for pencil hold. The children enjoyed exploring the medium: stamping and stomping, twisting and turning, pinching and popping. Then they started to think about what stories they would like to tell, what characters they would like to make, and what adventures they would like to go on. To create the characters they crunched and bunched the bubbles into shapes, binding them with masking tape to form a menagerie of creatures including butterflies, birds, snakes and cute little pets. They then had fun making up stories to share. At Staghills Children’s Centre in Rawtenstall, Pippa introduced innovative and exciting opportunities each week to inspire children to see the possibilities for fantasy and imaginative play. The children invented characters and developed story narratives for them to inhabit. 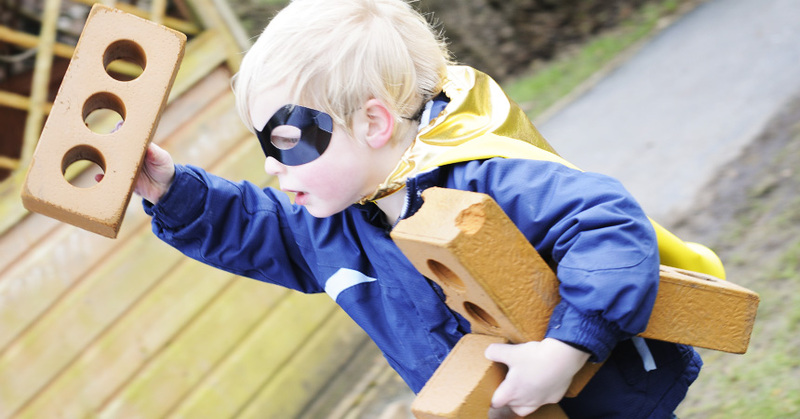 Even children who were previously reluctant to try imaginative play were soon eager to continue their mini adventures, switching seamlessly between role-play and small world play. The results were recorded in a beautifully illustrated practitioner resource book called Unlocking Imagination: Approaches to Small World Play. Pippa developed and led a Mark Making & Emergent Writing Project with children aged 3-4 at the Whitegate Centre, Padiham. Pippa created unique characters and story concepts to fire their imaginations, generating a real buzz about making marks! The activities were designed to build specific motor skills, focussing on both the secretarial and compositional aspects of mark-making and emergent ‘Handwriting’. The Me & My World book used an informal, scrapbook style to document a community engagement project with 3-5 year olds at Woodfield Nursery School, Brierfield. The objective was to help the children to develop confidence in communication, language and literacy skills. Inspiration drawn from the groundbreaking work of Wendy Ewald who pioneered the Literacy Through Photography programme at Duke University, USA. Key activities included photography training, community walkabouts and Small World Play using mini-me characters. Invite Pippa to bring an Story Session or Project to your setting by using the Contact Form. Pippa can also visit your setting for an Author Day or to share a little Storytelling Magic!